In particular, no part of the Just Bring the Baby.com web pages may be distributed or copied for any commercial purpose, or incorporated in any other work or publication, whether in hard copy or electronic or any other form. 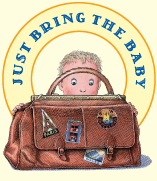 No part of the Just Bring The baby.com Ltd web pages may be reproduced or transmitted to or stored in any other web site or other form of electronic retrieval system. 1. Just Bring The baby.com gives no warranties and makes no representations, express or implied, as to the accuracy, quality, validity or completeness of any information contained in the Just Bring the baby.com web site and accepts no liability for any loss resulting directly or indirectly from the use of or reliance on any such information. 2. Just Bring the baby.com shall be under no obligation to notify any person of any error in the Just Bring The baby.com web site. 3. Just Bring the baby.com shall not be liable to any person for any direct or indirect loss or damage which may arise from the use of any of the information contained in any of the materials on this web site. 4. Certain (hypertext) links in this site will lead to web sites which are not connected with or under the control of Just Bring The baby.com. When you activate any of these you will leave this web site. Just Bring The baby.com has no control over and will accept no responsibility or liability in respect of the material on any web site which is not under the control of Just Bring The baby.com, and paragraphs 2, 3 and 4 shall apply in respect of such web sites as they do to the Just Bring The baby.com web site. 5. These disclaimers and exclusions shall be governed by and construed in accordance with [English] law. If any provision of these disclaimers and exclusions shall be unlawful, void or for any reason unenforceable than that provision shall be deemed severable and shall not affect the validity and enforceability of the remaining provisions. Allergy Foundation to clean our equipment. Member of the Baby Equipment Hirers Association.